In 1970, Salvador Allende won the Chilean presidential election as leader of the Unidad Popular coalition. He was the first Marxist ever to be elected president of a liberal democracy in the entire world. Soon after taking office, Allende’s first step was to implement a socialist programm called La vía chilena al socialismo (“the Chilean Path to Socialism”). These actions caused a raise of central government expenditures by 36% in real terms. Following this period of social unrest and political tension between the opposition-controlled Congress of Chile and the socialist President Salvador Allende, as well as economic warfare ordered by US President Richard Nixon, the government was overthrown by the armed forces and national police on September 11, 1973. On the same day Salvador Allende committed suicide. A militaristic Junta Government led by General Augusto Pinochet assumed power for over 17 years. The main problem of Salvador’s government was chronic inflation, which the country experienced in early 1970s. It had reached highs of 150 percent per annum (150% in 1972) under his presidency. Chilean economists, also known as the Chicago Boys (they studied at the University of Chicago, where Milton Friedman taught), implemented an economic plan called El ladrillowhich ought to transform the Chilean economy into one of the freest markets in the world. The plan recommended a set of economic reforms that included deregulation and privatization. The aim of these reforms was to “make Chile not a nation of proletarians, but a nation of entrepreneurs” as Pinochet said. The plan was divided into three stages: 1974-1983, 1985 and 1990. Three months after overthrowing the government, the annual inflation rate zoomed to 508 percent. The price of basic goods doubled every two months. By the end of 1973, the nominal average tariff for imports was 105 percent, to the maximum of 750 percent. These allowed foreign investment to skyrocket and forced Chilean enterprises to compete with imports on an equal footing. In June 1979, Sergio de Castro, Minister of Finance, decided to introduce a pegged exchange rate of 39 pesos per dollar. As the peso inflation rate continued to outpace that of the US dollar, there was a serious balance-of-trade problem. Every year Chilean purchasing power of foreign goods increased. In 1982, the bubble burst, thus sliding Chile into a severe recession that lasted more than two years. After that, Chile’s economy grew rapidly, export rose while the unemployment rate was plunging. However, poverty still posed a significant problem, with 45 percent of Chile’s population below the poverty line in 1987. In 1990, a program of growth with equity was launched. Over the next 10 years, poverty was reduced, a significant drop from 40 to 20 percent of the population being affected. 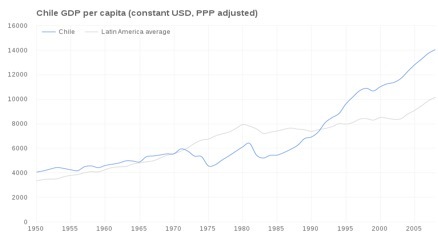 Chile is now the 20thfreest economy in the world (7thin 2015) and 42ndeconomy in terms of GDP (World Bank ranking). 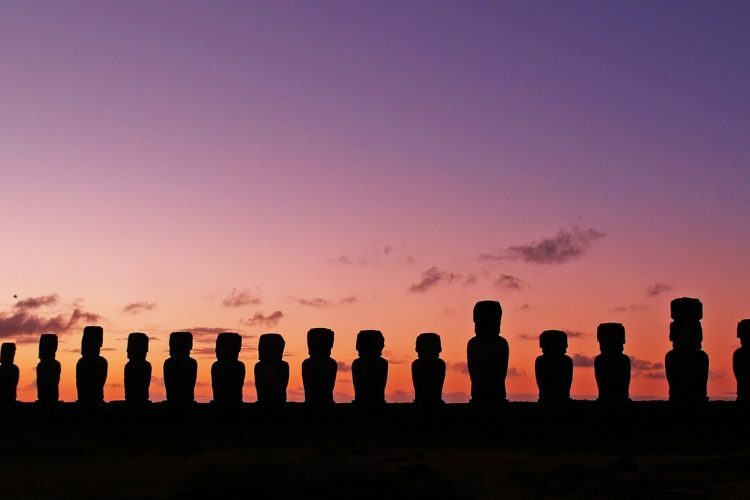 The country is considered South America’s most stable and prosperous nation. Chile’s annual GDP growth rate is now at 3% with a 1.3% inflation rate and 6.9% unemployment rate. It is still the country with the widest inequality gap of any nation in the OECD, but it is close to the regional mean. In 2008, only 2.7% of the population lived on less than 2$ a day. The current president of Chile is Sebastián Piñera, a liberal and businessman.